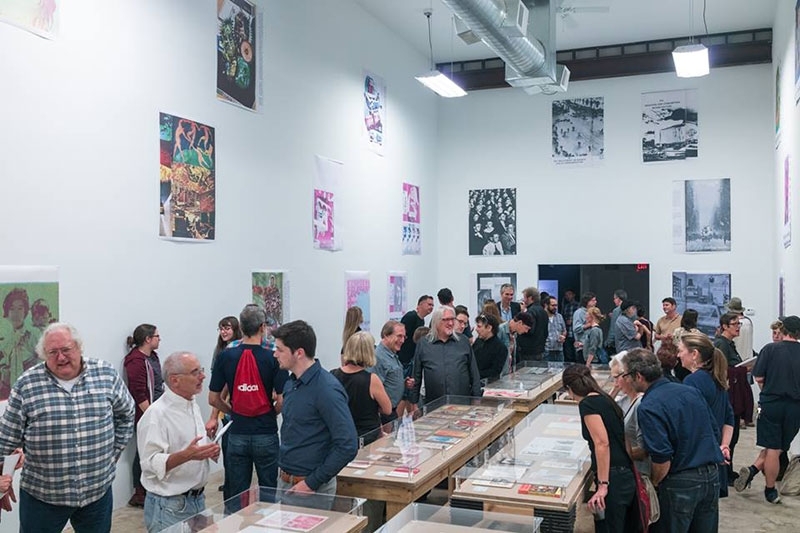 Photo from the opening by Matthew Garin. 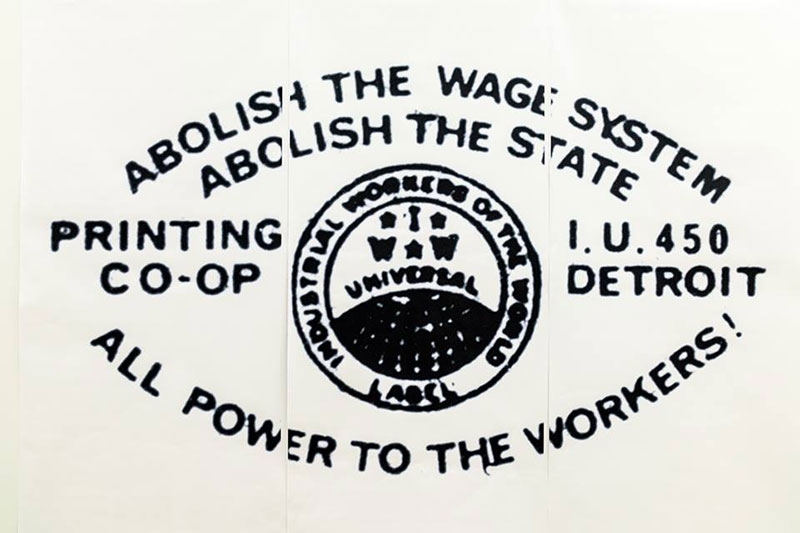 "In 1970 a group of activists acquired an old offset Harris Press, which they transported to Detroit in parts. They set it up in a building near the corner of Michigan Avenue and Vinewood. 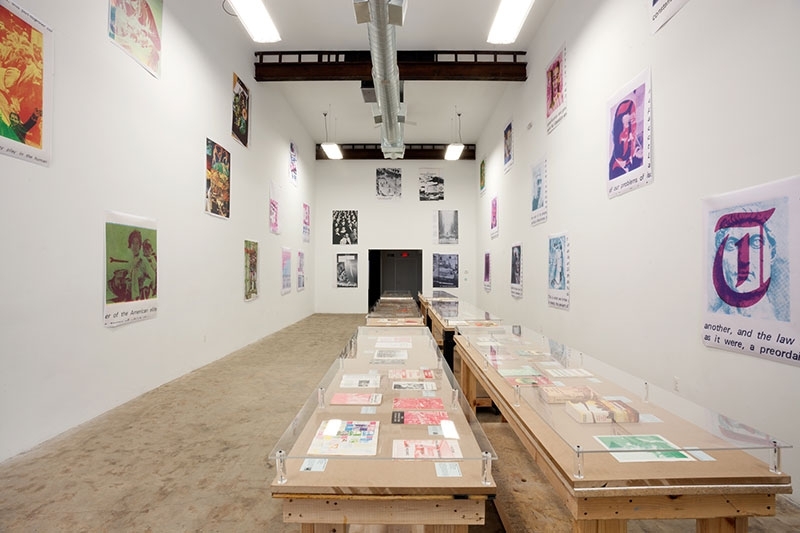 They acquired other equipment and materials and set up a print shop capable of producing tens of thousands of copies of books, flyers, posters, and pamphlets. The co-op was open to anyone willing to maintain and work with the machines. Founding member Fredy Perlman was a prolific and widely respected political writer and thinker. 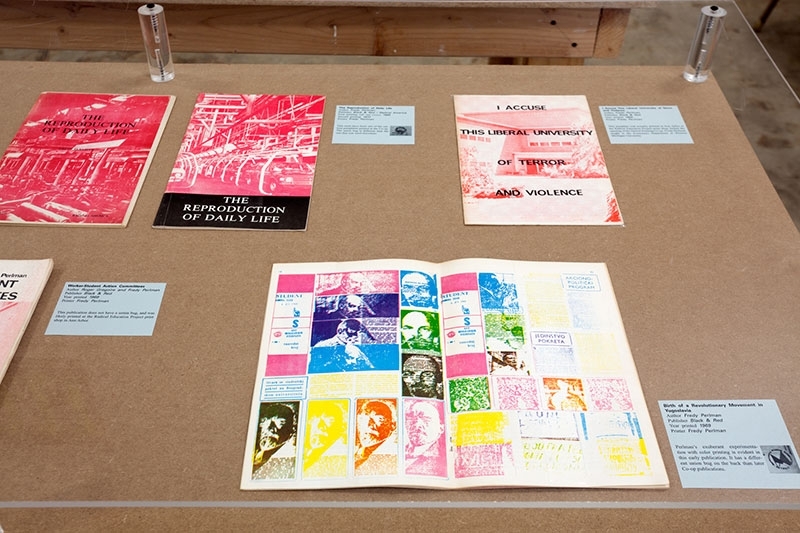 His experiments with overprinting, collage, and typography belie an interest in printing machines and in the visual appearance of the items made with them. 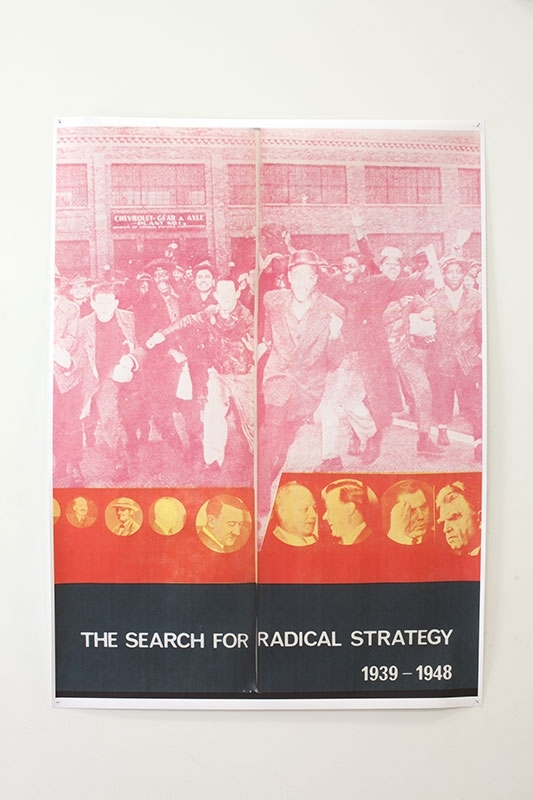 The posters on the wall are enlarged details scanned from books printed by Perlman, who often worked in collaboration with others. Perlman and his wife Lorraine printed all the books published by their press, Black & Red, at the co-op from 1970-1980. 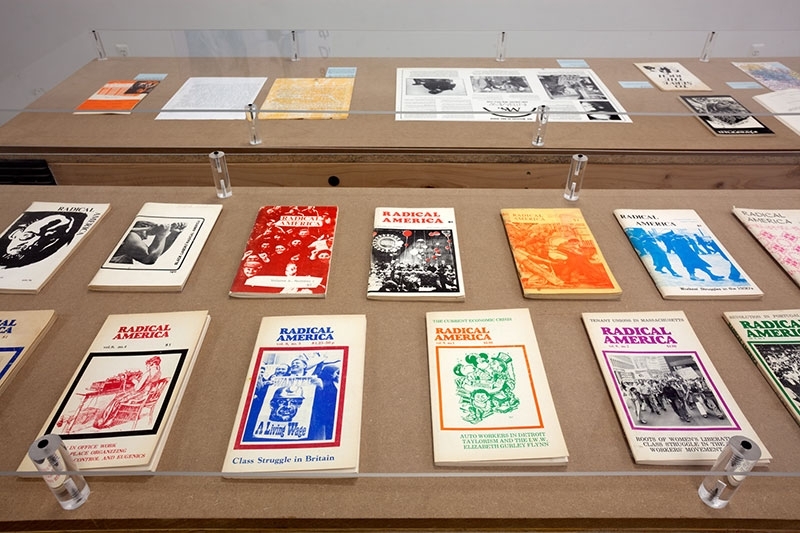 Many other groups came made use of the printing co-op: high school students, the publishers of Radical America, members of the League of Revolutionary Black Workers, and the editors of the poetry journal riverrun. 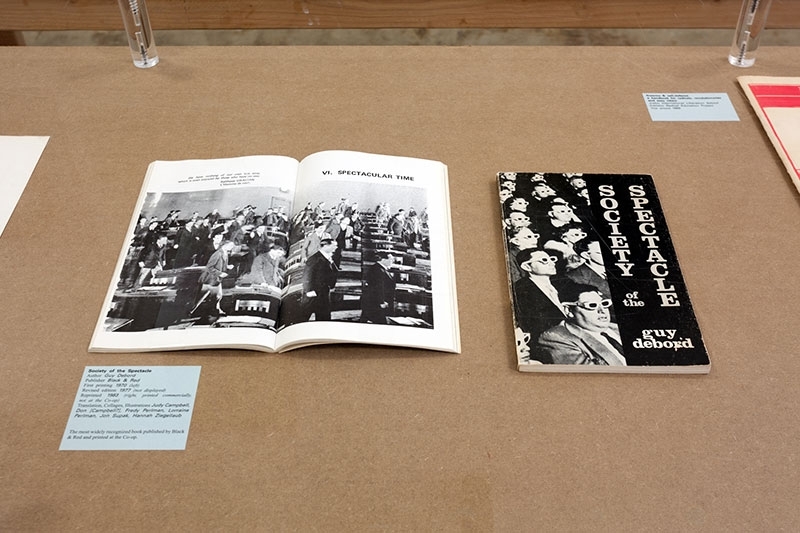 The most famous publication to be printed at the co-op was the first English translation of Guy Debord’s Society of the Spectacle. Thank you to Lorraine Perlman, Marty Fishhoff, Rebecca Mazzei and Stewart Shevin for the loan of printed publications from their personal libraries. 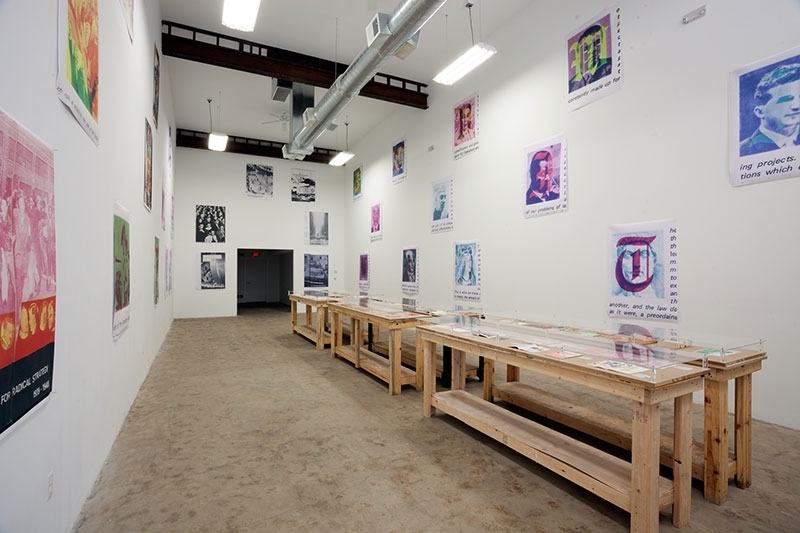 Financial support for the exhibition was provided by the Humanities Center and the James Pearson Duffy Department of Art and Art History at Wayne State University." Photos of union bug and of opening night are by Matthew Garin.